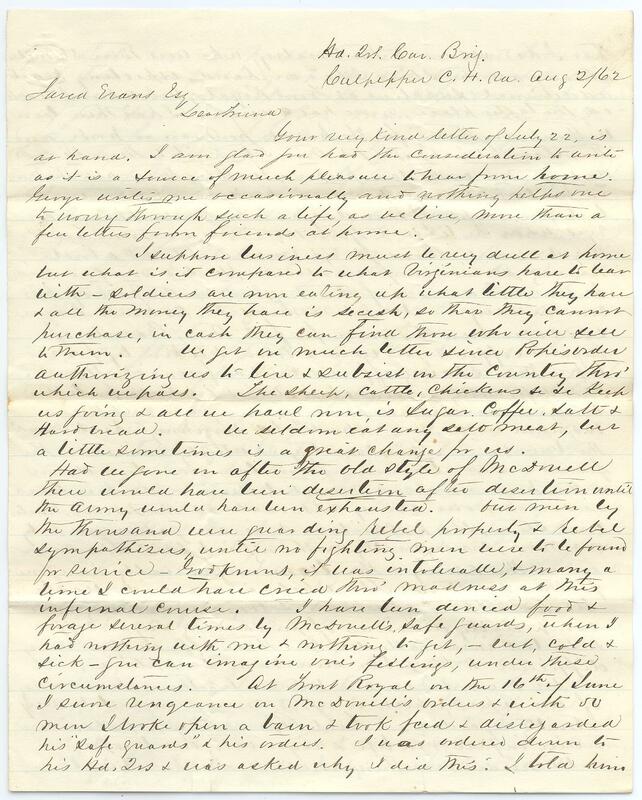 Item description: Letter, 2 August 1862, from Richard Corson, captain in the 1st Pennsylvania Reserve Cavalry, to Jared Evans, Esq. Item citation: From the R. R. Corson Papers #5263-z, Southern Historical Collection, The Wilson Library, University of North Carolina at Chapel Hill. Your very kind letter of July 22, is at hand. 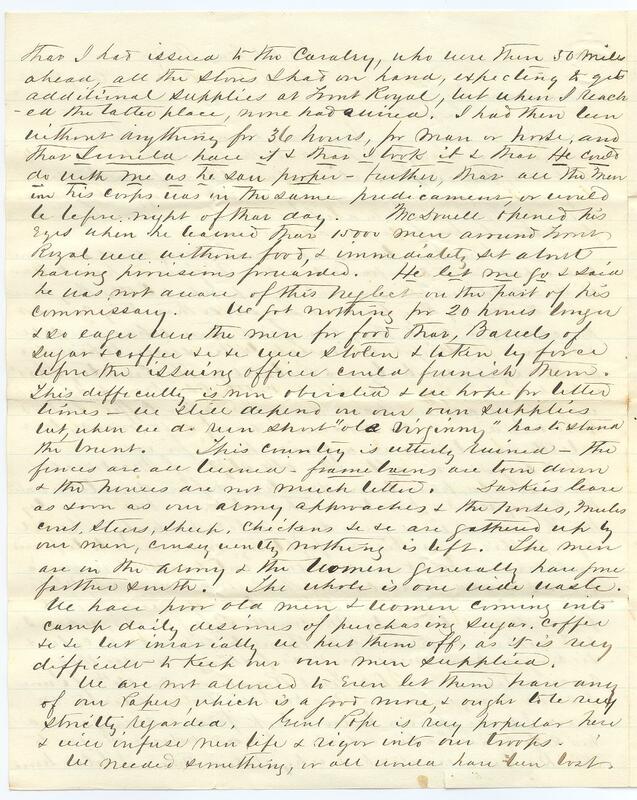 I am glad you had the consideration to write as it is a source of much pleasure to hear from home. George writes me occasionally and nothing helps me to [?] through such a life, as we live, more than a few letters from friends at home. I suppose business must be very dull at home but what is it compared to what Virginians have to bear with – soldiers are now eating up what little they have & all the money they have is secesh, so that they cannot purchase, in cash they can find those who will sell to them. We get in much better since Pope’s order authorizing us to live & subsist in the country thro’ which we pass. The sheep, cattle, chickens &c &c keep us going & all we haul now is sugar, coffee, salt & Hard bread. We seldom eat any salt meat, but a little sometimes is a great change for us. Had we gone in after the old style of McDowell then would have been desertion after desertion until the army would have been exhausted. But men by the thousand were guarding rebel property & rebel sympathizers, until no fighting men were to be found for service. God knows, it was intolerable, & many a time I could have cried thro’ madness at this infernal [curse?]. I have been denied food & forage several times by McDowell’s safeguards, then I had nothing with me & nothing to get, – but, cold & sick – you can imagine one’s feelings, under these circumstances. At Fort Royal on the 16th of June I [?] vengeance on McDowell’s orders & with 50 men I broke open a barn & took feed & disregarded his “safe guards” & his orders. I was ordered down to his Hd. Qrs. & was asked why I did this. 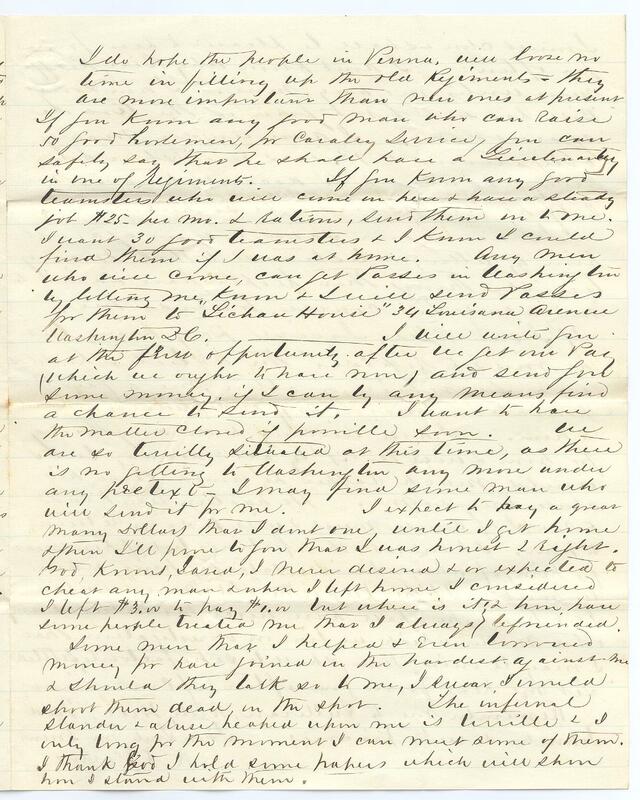 I told him that I had issued to the Cavalry, who were then 50 miles ahead, all the stores I had on hand, expecting to get additional supplies at Fort Royal, but when I reached the latter place, none had arrived. I had then been without anything for 36 hours, for man or horse, and that I would have it & that I took it & that He could do with me as he saw proper – further, that all the men in his corps was in the same predicament, or would be before night of that day. McDowell opened his eyes when he learned that 15000 men around Fort Royal were without food, & immediately set about having provisions forwarded. He let me go & said he was not aware of this neglect on the part of his commissary. We got nothing for 20 hours longer & so eager were the men for food that, Barrels of sugar & coffee &c &c were stolen & taken by force before the issuing officer could furnish them. This difficulty is now obviated & we hope for better times – we still depend on our own supplies but, when we do run short “old Virginny” has to stand the brunt. This country is utterly ruined – the fences are all burned – frame barns are torn down & the houses are not much better. Darkies leave as soon as our army approaches & the horses, mules , [? ], steers, sheep, chickens, &c &c are gathered up by our men, consequently nothing is left. The men are in the army & the women generally have gone farther south. The whole is one wide waste. We have poor old men & women coming into camp daily desirous of purchasing sugar, coffee &c &c but invariably we put them off, as it is very difficult to keep our own men supplied. We are not allowed to even let them have any of our papers, which is a good [? ], & ought to be really strictly regarded. Genl. Pope is very popular here & will infuse new life & rigor into our troops. We needed something, or all would have been lost. I do hope the people in Penna. will lose no time in filling up the old Regiments – they are more important than new ones at present. If you know any good man who can raise 50 good horsemen, for cavalry service, you can safely say that he shall have a Lieutenancy in one of Regiments. If you know any good teamsters who will come on here & have a steady job $25 per mo. & rations, send them in to me. I want 30 good teamsters & I know I could find them if I was at home. Any men who will come, can get passes in Washington by letting me know & I will send passes for them to “Lichan House[? ]” 34 Louisiana Avenue, Washington, DC. I will write you at the first opportunity after we get our pay (which we ought to have now) and send you some money, if I can by any means find a chance to send it. I want to have the matter closed if possible soon. We are so terrible situated at this time, as there is no getting to Washington any more under any pretext. I may find some man who will send it for me. I expect to pay a great many dollars that I don’t [owe?] until I get home & then I’ll prove to you that I was honest & right. God, knows, Jared, I never desired & or expected to cheat any man & when I left home I considered I left $3.00 to pay $1.00 but where is it? [?] have some people treated me that I always befriended. Some men that I helped & even borrowed money for have joined in the hardest against me & should they talk so to me, I swear I would shoot them dead, on the spot. The infernal slander & abuse heaped upon me is terrible & I only long for the moment I can meet some of them. I thank God I hold some papers which will show how I stand with them. I must close & shall be pleased to hear from you often. I don’t know why Bill Ruiff[?] never writes me any more. I am sorry Bill has seen fit to join in the tirade against me. I am under many obligations to Bill & will show him every chance to be decent towards me & if he wont, I will still be so towards him. I have never said a word against him by letter, or listened to the many [?] things that people have said to me, about his course, towards me. If I owe Bill, I will pay him, but he must replace the articles he sold at a sacrifice, or allow me a fair compensation towards my indebtedness towards him. I am willing to do anything for him I will do it by all means, but I would much rather he would cease his abuse towards me. He has been very kind to me & I of course must & will be so in return to him. I have no other feeling, but of kindness for him, of which I will satisfy him, when we meet. If he keeps the “old Mare” until I get home, he shall have twice her value & any other matter which we find in investigation that I may be owing him, shall be satisfactorily settled. Let me hear from you often, if convenient. Remember me to Sullivan, Billy, Hill, Ned Johnston & with kindness. 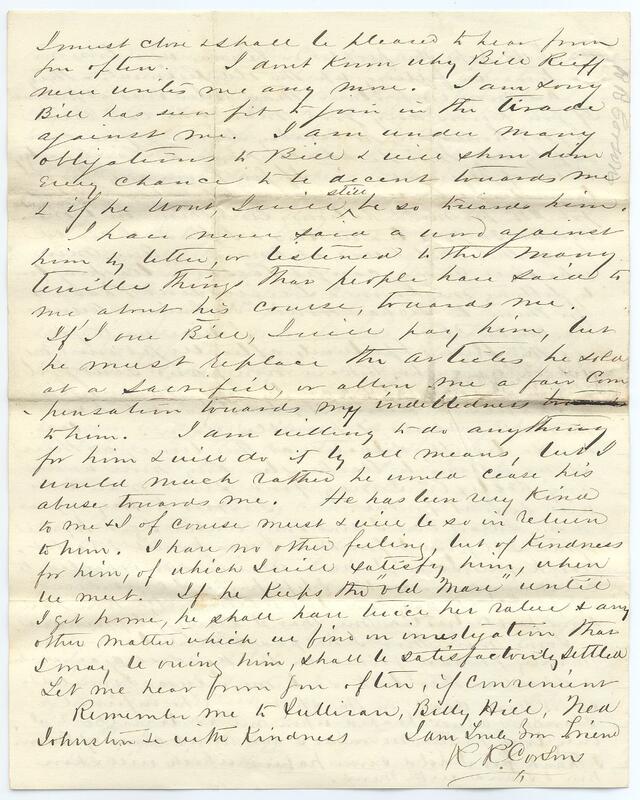 This entry was posted in Southern Historical Collection and tagged 1st Pennsylvania Reserve Cavalry, debts, Jared Evans, John Pope, Richard Corson. Bookmark the permalink.